Greenville sits at the edge of the kingdom, a small town with big aspirations. 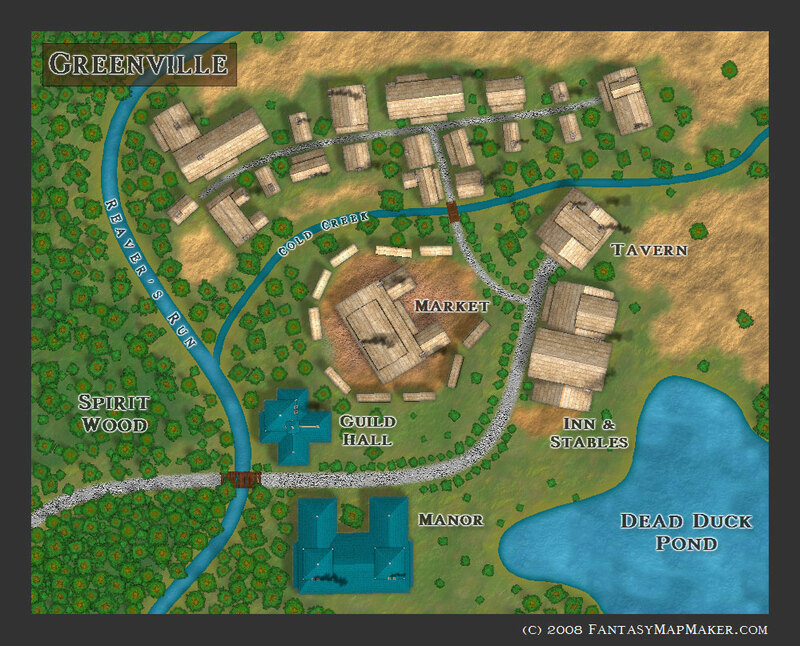 Despite its small size and frontier location – and thanks to its fortunate proximity to unusual resources – Greenville has attracted the attention of a wealthy patron and the powerful Mage’s Guild. They have come to gain control of the rare spiritstalk, a magical herb needed as a component for the most powerful of spells. Only the bravest of families live and work this deep into the Spirit Wood, where ‘strange events’ occur frequently: wicked howling fills the night air; bizarre creatures forage on the town crops; apparitions lure children to unsightly demises. It’s not an easy way to make a living, but the opportunity for wealth far outweighs the inherent dangers. 1. I do not like the trees, since the brown spot in the middle makes it look considerably less like real trees. 2. The buildings look good, but the layout of the village is too orderly. Real buildings would have sprouted up closer to one another, rather than along a road or path. 3. Overall, it’s not a bad looking map. The choice of colors gets the thumbs up. 4. It has lots of trees, but little detail, otherwise. What, exactly, don’t you get? Fantastic map. Do you do requests? I’m about to publish a Labyrinth Lord adventure and the style used for this village is perfect for the one in the scenario. Really great stuff! Thanks Pete! Unfortunately, I don’t get as much mapping time as I’d like, so requests are sometimes hard to do. That said, feel free to drop me a line and let me know what you’re looking for. Even if I can’t do it, I can probably point you in the right direction to find someone who can. Nice map for an early D&D adventure or series of quests. small village, ideal for few NPC’s and rural setting allows for small CR(Challenge rating) enemies. (Ideally maybe return at later levels(7-8-9) to find crops ruined, and buildings burned) etc. Continuity as element of change in surroundings. Gorgeous map, beautifully done and eminently playable. 1) Aesthetically, the trees are weird, but it’s not a huge issue, the style fits. Gorgeous map. 2) From a world-building perspective, few places are the terminus of The Road, this village is. That’s a curious thing. Particularly with such a large inn, large inn’s usually reside where roads continue on, and cross-roads. 3) Also from a world-building perspective, the layout of the buildings seems sufficiently organic, but you need at least twice as many residential buildings to support a village center of the size you have; the market alone cries for a larger population.